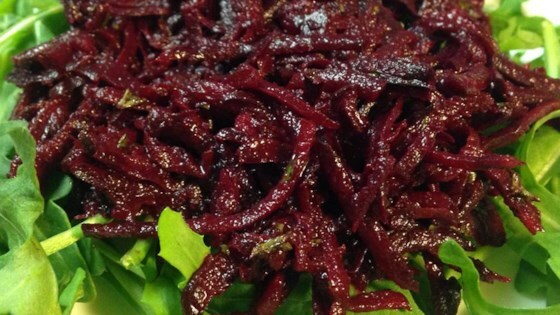 "I was looking for a way to use raw beets and found a recipe online. I changed it a bit to use ingredients that I grow and use. It's so yummy and is so nutritious because the nutrition isn't cooked out of the beets. Everyone that has tried it, likes it. It's better if let set for a few hours but doesn't have to be. Serve for a cold lunch with boiled eggs on a bed of lettuce." Combine beets, balsamic vinegar, olive oil, parsley, garlic, mustard, sea salt, and black pepper in a bowl. Didn't have parsley, still full of flavor! Will make it again. I like beets and they're so good for you. But I only knew of 1 or 2 ways to use them. So I was really happy to find this recipe. This turned out great! I've made it several times now. I didnt have dijon mustard so I subbed a tsp of yellow mustard and a tsp of worcestershire sauce. Used apple cider vinegar. Kind of tastes like a beet ceasar salad! I also had no parsley. What a wonderful light fresh salad. It is nice and tangy.